I've read about painter's tape used as a quilting guide and got a chance to try it out today. The thing is the painter's tape which available is not of good quality and I don't have a masking tape. I have cello tape. That should do, right? Now if you use this tape, don't press it so much, as it works only as guide. You don't want any residue sticking across your quilt, right? So, I finished quilting it quite fast . I am not very good in eye-balling my stitch, so this tape is really my savior. 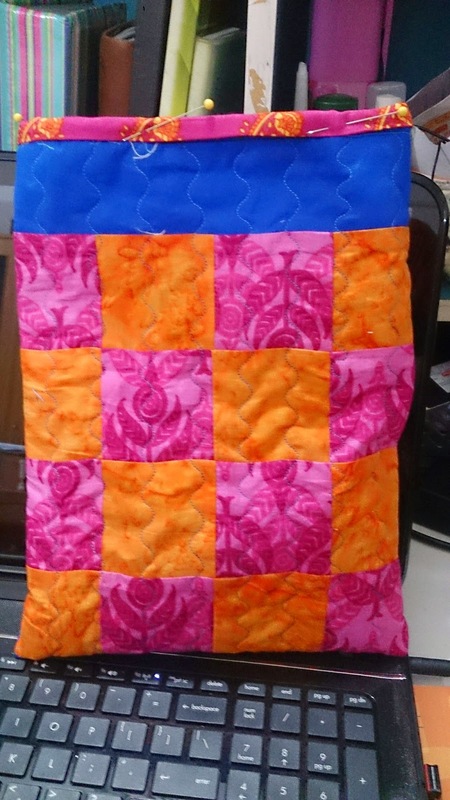 I recently found that standing and quilting is much more comfortable. It's easier to maneuver the quilt and easier on my shoulder too. That way, I can see my stitches better too. Well, I get a bit tired standing but then you can always take a break in between. Oh I love the corner part. - if you use cross cut binding - that is you cut your binding across the width of fabric (WOF) - you have to make sure grain is straight. I always start my binding from the middle. When you reach the corner, put the needle up, turn your quilt, flip the folded fabric up and start sewing from the top. 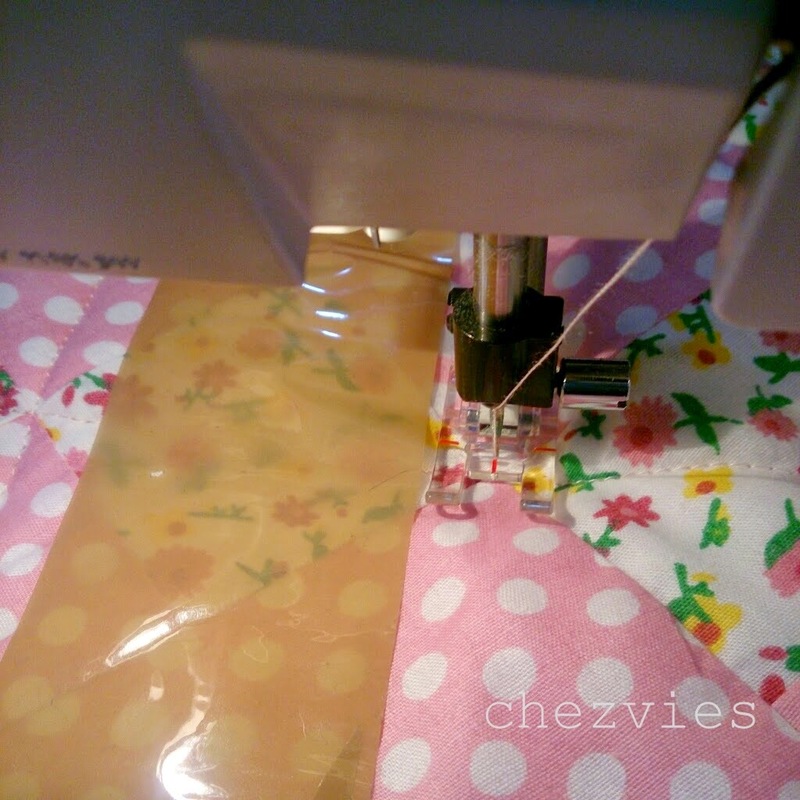 A little trick : I usually sew few inches from the top, stop, put my needle down and pull the end of the binding inserted inside the diagonal, neaten it and clip it. Forgot to take the pic with the same binding LOL. Anyway this part is important. DO NOT trim too much. I normally just eyeball it. It should be not less than 1/4". Sometimes - in my case it's "always" - the seam is not even. so, carefully trim it. turn it around, put lots of clips. I was like "which one is more fuchsia, should I go for the darker one or the lighter one"
"if there's a will, there's a way"
Now I truly believe it! This iPad sleeves is SOLD but I still have the fabrics. and I made a keys cover from the little remnants. 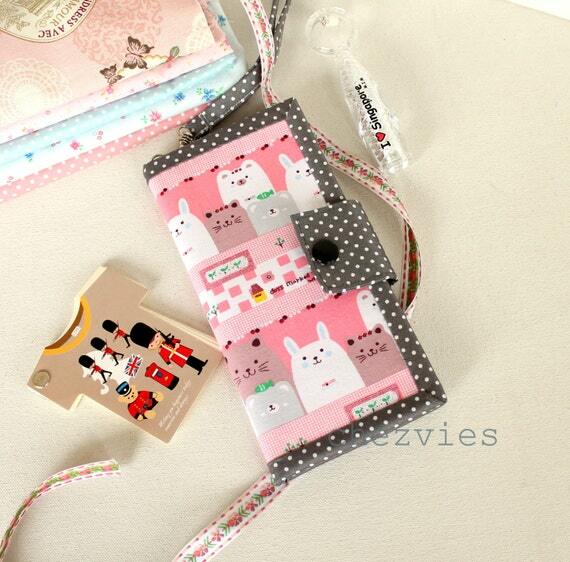 Someone is going to have that cover ^^. I hope she will like it. Second Fun is I joined this mug rug swap in Desi Quilters. I have this postage stamp blocks, so I decided to make from those blocks. This was inspired by Suzuko Koseki book. I love how simplicity can be really pretty. The red riding hood was a last min addition. While I was straightening the block, I saw this Red riding hood strip peeking from my scrap bin and voila, it gives a cute addition, doesn't it? I have a little left of the pink roses fabric and I thought it would be nice as a backing and binding. Quilt it using straight lines 1/2" apart. Second mug rug, I was thinking of doing the same, then I saw the star strips from the wallet I'm making, so why not make a star roof? The grey fabrics are left over binding strips from my wallets. Now, I'm back on doing few custom orders due this week. Mini table topper made for Desi Quilter's Spread Some Cheers which sponsored by The Square Inch. This program is to help raise fund for Swanthana, a home for physically and mentally challenged girls based in Bangelore. If you'd like to participate, you can read more further information HERE. I sent this cheerful table topper to sell at the school fairs and the proceed will go to the Home. Hopefully it will fetch a good sum. I made this based on Quilting in the rain's Book "Quilt as you go made modern"
It's very addictive. I plan to do the quilt along, but I will take my time. It's going to be my fun projects. You know when you're doing the same thing all the time and you need to recharge by doing something fun. I tried different decorative stitches here and it was a lot of fun!! I always love Rita of Red Pepper Quilt's binding and how fab it is. If you notice, my project always take a long time to complete, that's because I took a long time to decide what backing and what binding will work best. Sometimes I even mulling over what quilting line should I do. 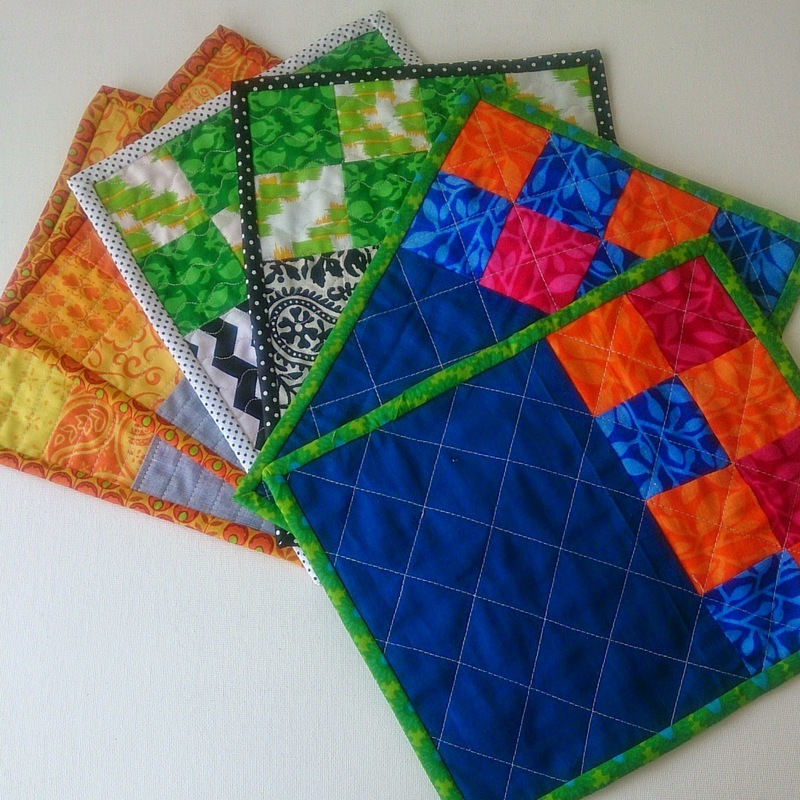 Especially for small quilts, I am extra careful in choosing my fabric combo. What about you? What fun did you have?